1962: Britain's first Casino - Brighton, London or Southport? Doing a keyword search at ITNSource.com I've come across this description of a clip in Reuters video archive. BRITAIN'S FIRST CASINO WAS DUE TO OPEN AT THE FASHIONABLE SEASIDE RESORT OF BRIGHTON, ON THE SOUTH COAST OF ENGLAND, JUNE 2. PREVIEW SCENES WERE FILMED ON JUNE 1. AT ELEVEN TABLES IN THE CLARENCE ROOM OF THE METROPOLE HOTEL, CHEMIN-DE-FER, CHEMMY ROULETTE, CHEMMY DICE AND QUATRE CHANCE WILL BE PLAYED AT ALL HOURS OF THE DAY OR NIGHT WHENEVER THERE ARE PEOPLE WHO WANT A GAME. BECAUSE OF THE GAMING ACT, ONLY MEMBERS CAN PLAY AND THEY ALREADY NUMBER HUNDREDS. UNDER THE PROVISIONS OF THE ACT, CLIENTS MUST HAVE AN EQUAL CHANCE. BUT THE PROMOTERS EXPECT CHANCE TO BE KIND. ABOUT GBP250,000 POUNDS ARE SAID TO HAVE GONE INTO THE VENTURE. THERE ARE MEMBERSHIP AND TABLE FEES, CHIPS REPRESENTING TWO SHILLINGS AND SIXPENCE TO A HUNDRED POUNDS, AND MAXIMUM STAKES OF GBP400 IN SPECIAL CONDITIONS. A STAFF OF 100 - RECRUITED FROM BANK CLERKS, TEACHERS AND ARMY OFFICERS - HAVE BEEN TRAINED BY A PROFESSIONAL FRENCH CROUPIER. UNDER THE SECURITY ARRANGEMENTS, GUARDS WILL BE AT THE DOORS AND SPECIAL PASSES ISSUED TO MEMBERS WILL BE CHECKED AND CHECKED AGAIN. WHAT SORT OF PEOPLE WILL FREQUENT THE METROPOLE CASINO CLUB? THE CLUB'S DIRECTOR-GENERAL, M.JEAN-MARIE CRUCIANI, WHO RESIGNED FROM A FRENCH CASINO TO COME TO BRITAIN, SAID HE WAS TRYING TO ATTRACT ALL SORTS OF NICE, DECENT PEACEABLE PEOPLE - JUST LADIES AND GENTLEMEN WITH ??? MORE OR LESS.". What do you think. Correct - or were there other operations up and down the country that had already opened for business ? Dug a little deeper into this and it appears that Britain's first casino was actually a ship on the Thames. MOVIETONE CARD TITLE: Chemmy By the Thames. DESCRIPTION: Old Father Thames has seen a good many things in his time, but now some new goings on have started right on the bank of the river. Parliament has decreed it's legal to play chemin de fer (commonly known as chemmy), and the River Casino is the first French-style casino of the kind to open in Britain. Arriving by water as yachtsmen could do, our camera crew had come to get an impression of the scene. SHOTLIST: Key scene. LS boat. CU funnel. MS boat under bridge. GV Big Ben. MS boat on river. MS ditto. CU man's hand. MS cameraman. GV people at table. CU sign. CU money. MS man. MS six-pack shoe. MCU woman. CU woman places bet. CU man. MS man with cards. MCU man with cards. MCU man and woman. MS ditto. MS man. MS game. MS banker. MS game. MCU woman drinking. The clip is right... the Metropole Brighton was Britain's first proper land based casino under the loophole of the Betting and Gaming Act 1960. 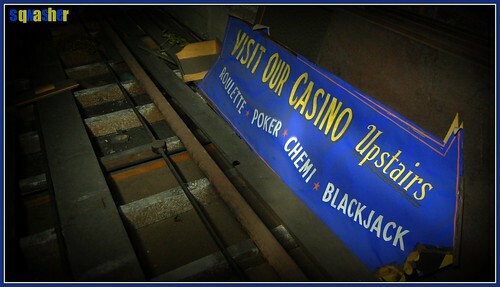 The casino remained in the same location for more than 20 years but issues with access to the gaming floor through the Hotel & the need to build a new dedicated entrance + additional local competition slowly starved it into history. As of early 1983 both the casino at the Metropole Hotel and the International Sporting Club on Preston Street next door were in operation, I'm not sure when the hotel casino finally closed. The ISC had opened on April 2nd 1982 (Falklands War anyone?) and we had been in training waiting for the transfer of the license from Corals. As our gaming licenses came through one by one we were told we were going to do some odd shifts at the Hotel before the ISC opened. Hence my first night working as a dealer in 1982 was at the Metropole Hotel - I can remember them scratching at the doors in reception at five till eight while I stood trembling at the roulette table closest to them - aaagghhh!!!!!! I do remember and often talk of the two and six chips Thorndyke mentions above - they were plum colored and each table had one stack to use as an odd 25p when coloring up. What was amazing about them was that they were made of slate, twenty seven years later, still the finest chips I have handled. The operation in Brighton detailed above wasn't Britain's fist casino at all. Doing a search on the European Document website Europeana there were several operations open in Scotland at the end of the 1950's. This one is dated 27th September, 1958. The New Grafton Gambling Club in January 1959. Perhaps we also think of guides to gaming as something new. Obviously not.... This one is from circa 1860. Unfortunately Randy Steed is no longer with us and there are messages of condolence on Gamingfloor.com's message board from earlier this year. Here is the link to the article and it makes interesting reading. It's a shame that he didn't do more. He refers to a really small club on Curzon Street on page 26, I would guess that this is the White Elephant Club. The licence from this club I think was transfered and became the original Ritz Club licence for London Clubs in the late 70s and then the licence was transfered again and became 50 St james. Just found this document on the National Archive website. c.37 plans relating to proposed alterations to the Legalite Casino Club, Stourbridge [in West Midlands], for Kent and Thanet Casino's Ltd., of Broadstairs. It appears what we have next is the description of a modified Roulette wheel.
" here the plaintiff company had introduced a number of modifications in the design of a rotor table got registered by it. They had substituted 36 pockets for the original 37; excluded certain numbers, six in all, 5 and 24, 7 and 28 and 17 and 34; these particular numbers were selected because they provided three double width gaps as symmetrically located as possible, leaving sectors of 9, 10 and 11 numbers between them; they had retained alternate red and black colouration for the numbered spaces and applied a green colouration to the three double width spaces. In the circumstances Lloyd-Jacob, J., found 'if one looks at the design representations which accompanied this application, a pattern for the rotor rim is plainly observable, making, as it does, a definite appeal to the eye and which, judged on observation alone, is different from the only previously known rim pattern, that is, that of the roulette wheel, and different in recognisable respects, respects which are neither immaterial nor are they known trade variants. As a result, it seems to me, the design must be held to be valid if the statement of novelty is correctly construed in the narrow sense which I have indicated'. Now why would a Dance School object to the modified design of a Roulette Wheel ? Got to be an interesting story there. Perhaps it's time for a search of the UK patents database ? By January 1963 Legalite was even being played in Shipley near Bradford. "The building was now owned by Eckhart's Star Cinemas of Leeds who converted it into the Glen Casino, with manager Vincent Gallagher, for bingo together with "Fast, Exciting, Thrilling legalite Roulette direct from the Continent" opening on Thursday 8th January 1963. Star retained the Glen part of the name though that was later changed to EMI Bingo and Social Club in 1974 and lasted until the premises closed in 1982. The White Elephant Club was located at the current site of Aspinalls Casino at 27 or 28 Curzon Street. The 1962 Chemmy on the Thames fim that was at Movietone News has disappeared but I've found a similar - possibly the same clip at ITNSource. The operation appears to be on the Thames in Chelsea but the interiors don't seem to match the original shot of the boat. Local resident apparently threated after showing opposition to the Victoria Sporting Club on Edgeware Rd. in 1966. Report on Mr Alec Eden, whose family was threatened after he opposed the granting of a music licence to a local casino called the Victoria Sporting Club. 'Reporting 66' was a series of documentary reports from around the world, produced by ITN News and broadcast on ITV during 1966. Black and White B/W material. Casino style gambling as we've seen only took off in the early 60's. So assuming one was from a certain social class where could we have a Punt prior to that ?. Perhaps we might have received an invitation to attend private games as organised by the late John Aspinall or we could possibly head to the French coast for the weekend. Below is a poster from the late 50's or early 60's that may have been displayed in travel agents or at railway stations in the South. Chemin de Fer North - 2 Hours 45 minutes to Paris, 3 Hours to London. For anyone with money burning a hole in their pockets such an image would certainly have caught their eye. 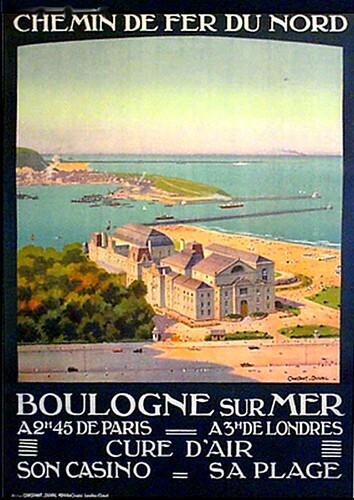 The Chemin de Fer du Nord was the name of a train and not the game at Boulogne sur Mer. Although Sylvie Leroy at Journal des Casinos tells me that is the casino in the image. Poster believed to be 20's/30's. I believe, and this of course should not be taken as historical fact , that the first casinos in Britain were perhaps in Edinburgh & Glasgow. This photo from The Scotsman is dated September 1958. So time for a look on Google Street view for 16 Home St. Edinburgh. The Scotsman Newspaper own the rights to all three images. The Sheffield Star has a feature on the Windsor Cinema in Balby a suburb of Doncaster. "At the beginning of November 1962 it was revealed that the cinema was to be renamed the Windsor Casino and would be open each night except Tuesdays and Wednesdays, with bingo sessions starting at 7.45pm and roulette around 9.15pm. Workmen moved in after the last film showing on Sunday, November 4, and by working night and day had the casino ready the following Thursday. The screen was removed and the roulette tables installed on the stage area with the bingo players in the large auditorium." Their recruitment policy was interesting. "He said: “We are installing continental-style tables and bringing in trained croupiers at first, but we shall be recruiting local people, who will eventually take over. “We are looking for glamorous and intelligent young ladies and smart young men, who are good at figures, to operate the tables and we are keeping on all the existing staff in one capacity or another.” "
met a very interesting elderly chap last week in my place of work (no longer a casino) and we got chatting about what I do etc, told him I used to work in casinos and had an interest in the past and history of casinos in London, he threw a lot of names from the past, I was scratching my brain trying to think of Randy Steeds book, which he expressed an interest in, bumped this to refresh my memory! As mentioned in the first post on this thread England's first casino opened on the 2nd June, 1962 in the Metropole Hotel. ITN may possibly have a record of the event somewhere in their archives. The Hotel is now known as the Hilton Brighton Metropole and stands next door to the Grand Hotel which was where the IRA attempted to assissinate Margaret Thatcher and her Cabinet at the 1984 Conservative Party Conference. Members have said that the casino remained open in the Hotel until the mid 80's and then moved to the International on Preston Street. There don't seem to be too many images available of the International so I'll post a Google Street view of what is now the Genting Casino.